In this month's Art in America, I've written a new feature piece titled "The Practical Precariat." Therein, I discuss the ways that a group of artists have responded to dwindling institutional support by developing mutual networks of aid. The piece includes Bay Area dancer, choreographer, punk musician, author, and filmmaker Brontez Purnell; Miami-based filmmaker, visual artist, and co-founder of the Borscht Corp film collective Jillian Mayer; artist, educator, and Whoop Dee Doo co-founder Jaimie Warren; and comedian Chris Gethard of The Chris Gethard Show, HBO's Career Suicide, and the Beautiful/Anonymous podcast. And I got to shout out two of my favorite boys, Steven Phillips-Horst and Eric Allan Schwartau of Talk Hole, for their hilarious riffs on gig economy aesthetics in the promotional materials for their monthly shows (perhaps you remember them from episode 06 of the Humor and the Abject podcast). 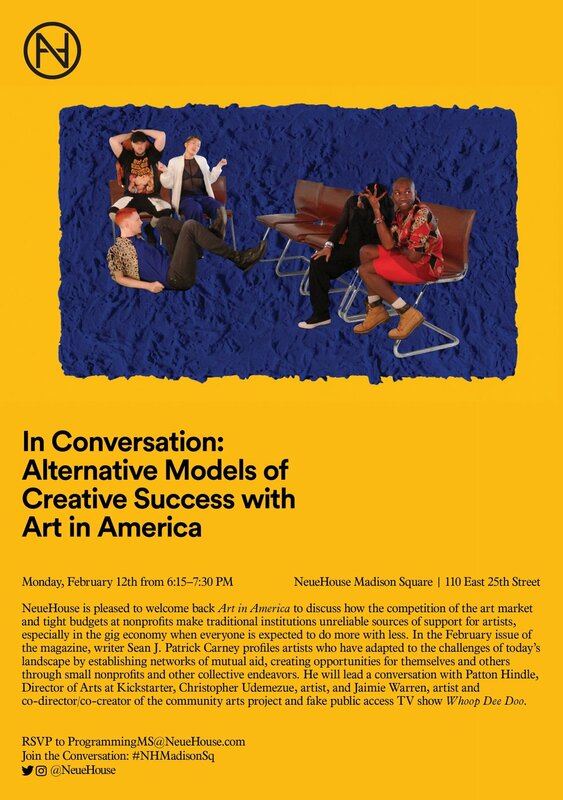 Tonight, Art in America is hosting a special supplementary conversation to the article at NeueHouse Madison Square. I'll be leading the discussion, and I'm absolutely thrilled to be welcoming the aforementioned Jaimie Warren to participate. Also joining me will be artist Christopher Udemezue (RAGGA NYC; House of Ladosha) and Patton Hindle (Kickstarter Arts; yours mine & ours gallery).